Stressed? Depressed? Anxious? Need more Peace? There’s a saying, “Reiki finds you when you need it and it gives you what you need!” Reiki is energy healing that brings you back to the real you: balanced, recharged, and refreshed. Perhaps, you have a lot of emotional baggage. Perhaps you need help with physical pain. Or maybe you are grieving deeply. Maybe you’re in a big transition and need direction. Or, you could be waking up spiritually and want to deepen your practice and connection. Maybe nothing is wrong but you are into holistic healing and want to tap into your full potential Regardless of where you’re at Reiki healing will work for you. Often we know what we need to do, but fail to do it. If your chakras are blocked or worse: closed, you can get stuck in a neurotic loop, where the energy literally is stuck and you are in a perpetual patterns you can never seem to transcend. Good news, you can fix this! In my sessions I love to incorporate crystals, intentions, and affirmations to help give you what you need. How Does Reiki Energy Heal? Everything in this universe is energy. Everything you see has molecules vibrating at different frequency to create matter. Our bodies are energy. 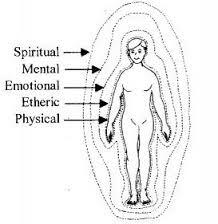 The layers of your aura have layers known as the etheric, emotional, mental, and spiritual bodies. 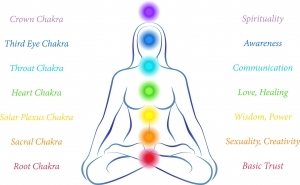 We also have energy centers within us called chakras that can be open, closed or blocked. Our chakras and energy bodies have been energetically pre-programmed since the womb, and throughout life. Traumas, even ones we may call insignificant, are stored in our cells. Science calls this bio-energetics. Reiki Energy heals at a cellular level. That is why it is used in cancer centers and over 800 hospitals across the nation. Reiki comes from Japan, and it’s mostly known to be spread by the founder Mikao Usui and brought to the West by Mrs. Hawayo Takata. The word Reiki comes from two Japanese kanjis. Rei which is “Universal life force” and ki for energy”. This universal life force is the highest vibration and frequency, that comes from the universe or “source”. Although there are other healing modalities out there, Reiki is a healing energy that works with the highest frequency healing energies. A Reiki treatment or class will ground these healing energies into your physical bodies, and removes toxins that create imbalance. Reiki aligns your mind, body, and spirit. Furthermore: it clears your emotional garbage! The memory will remain, but the hurt and charge can be released. Often if ignored our emotional issues have a way of manifesting physical pain. You can release these energies naturally and heal your past. We all have the potential to be fully satisfied and joyous in our lives, Reiki will help get you back to the real you.